The Salzburg Festival will occupy the inner courtyard of the Salzburg Residence for several years, beginning in summer 2012. The all side closed atrium is part of the ancient city of Salzburg (UNESCO World Heritage Site). 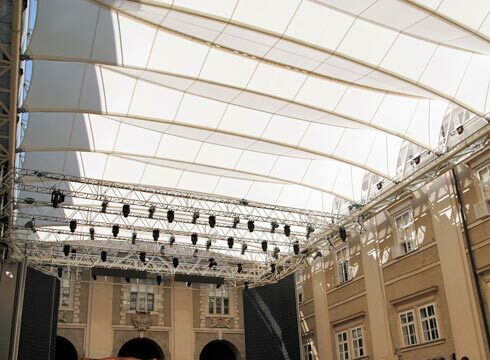 Centrally located, the courtyard becomes a weather proof venue, protected by the retractable membrane, opening and closing automatically within minutes. Adopting this measure, no alternative indoor venue has to be provided in case of bad weather conditions. The whole roofing structure will be mounted and dismounted for multiple years. The protected buildings remain unaffected, only minor horizontal forces are anchored at the facades. The steel structure is built up of a variable framework, supported by four steel columns. The framework serves as catwalk for lighting technicians, situated 14m above ground level. The rectangular, 22m by 37m opening can be closed by a parallel foldable textile membrane, moving alongside the framework girders. The textile fabric is carried by ridge-and-valley cables. The hanging ridge cables are connected to a rail by gliding track carriages. The valley cables are bound to the lower rail. Opening the roof, the membrane becomes prestressed in both directions for bearing the wind loads. Therefore an efficient linear system is used, sliding easily even under high forces. While the roof is open, the membrane is folded under a textile membrane shelter at the east side. The shelter is carried by the framework as well, closing the irregular part of the courtyard.